Just go here and scroll down to see the info for the start line of your choice. On that page you’ll find the times you should ARRIVE to check in. Please do NOT arrive earlier! You’ll just be in the way, and the set-up crew is surly enough at this hour. Go home and go back to sleep! Look for the times check-in ENDS too – if you’re late, you’re out of luck! Riders who attempt to start the ride after the cut-off times will be fed to a pack of hungry dogs. (Any remains will be denied access to the ride). No refunds. WHAT SHOULD I DO WHEN I ARRIVE AT MORNING CHECK-IN? 1. If you need to pick up your rider I.D. wristbands, go to the check-in table. If you already have your rider wristbands, skip this step. We’ll have info for you in the morning on where to load your luggage, pick up your route sheet, catch morning transportation, grab free breakfast... (It all varies just a bit depending on which route you pick, and it’s WAY too dull to spell out here! Not to worry -- we’ll take extra-good care of you. OK, But What Time Can I Actually Start to PEDAL? We do NOT do a mass start -- you can take off whenever you’re ready. BUT... don’t forget that for MOST routes we check you in and then transport your bike and you to the place where you actually start to pedal. There is no charge for this morning transportation, and you do not need to sign up for it separately. Don’t ignore those check-in times, but here’s our ESTIMATE of when you will actually start pedaling -- what around our house we call “foot-to-pedal”. 150-mile route: 5 a.m. - 6 a.m.
108-mile route: 6 a.m. - 7:30 a.m.
73-mile route: 9 a.m. - 10 a.m.
25-mile route: 10:00 - 10:30 a.m. If you want to register on the day of the ride just show up in the right place at the right time and we’ll take good care of you. Please note that "day-of" registration is much more expensive for all routes and distances -- and is cash-only or credit card -- no checks ever. On-line registration is available until September 5th at noon here and is faster and cheaper for you. We serve a light breakfast at the start lines (probably bagels, doughnuts, coffee, and bananas, or similar) so if you're dreaming of a giant stack of flashbacks with maple syrup, better eat up before you get there. All of this means that we love you, but that if you are eating a strict diet, you should bring some snacks with you, or buy them along the route. We do not serve bottled water on any of our rides. Click here to see why. There are many stores along the route where you can buy bottled water if you wish. 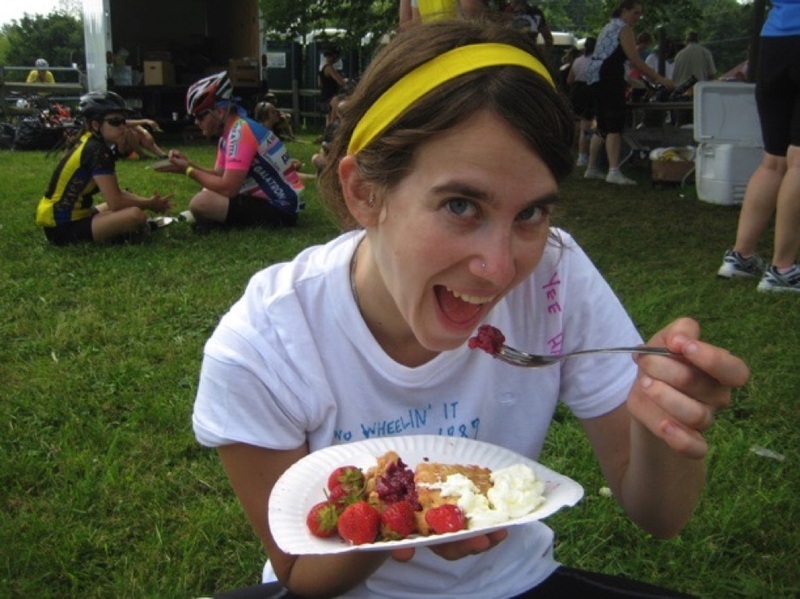 At the finish line we serve a free all-you-can-eat meal suitable for vegetarians and meat eaters. We'll have bike repair experts along the route. ALL bikes can get flat tires. Even if you don’t know how to change a flat, be SURE that you are carrying TWO extra tubes that fit your bike, a pump, and a patch kit. If you have these items with you, someone else can help you. If you don’t have this stuff, it’s going to take MUCH longer to get you back on the road. S.A.G. stands for Support and Gear -- these are the wonderful folks who will help you if you can't finish the ride because your bike breaks, you pull a muscle, or you're just too tired to pedal. We provide the best S.A.G. service of any bike ride in the U.S.
S.A.G. On the Move -- we'll have vehicles with bike racks continually driving the route throughout the ride. Just stand by the side of the road in a safe place and we’ll be there to help! To get help, you MUST signal them! The best way to do this is to place your bike upside down (handlebars and saddle touching the ground) and then stand in a safe place by the side of the road, giving the thumbs-down symbol. Finish Line S.A.G. -- no matter what, ALL cyclists need to be at the finish line no later than 6:00 p.m. so they'll have time to shower, eat, and get transportation home. The Finish Line S.A.G. team drives along at the very end of the ride and looks for people who need help. They are the clean-up crew who make sure that everyone is off the road by the end of the day. This service goes from the Blue Point rest stop straight to the Water Mill rest stop. If you want to hop out there and keep pedaling that’s fine -- you will be ABOUT 28 miles from the finish line. If you prefer you can stay on the bus and we’ll head from Water Mill straight to Montauk. This service goes from the Westhampton Church rest stop straight to the Water Mill rest stop. If you want to hop out there and keep pedaling that’s fine -- you will be ABOUT 28 miles from the finish line. If you prefer you can stay on the bus and we’ll head from Water Mill straight to Montauk. This service goes from the Water Mill rest stop to the Montauk finish line. 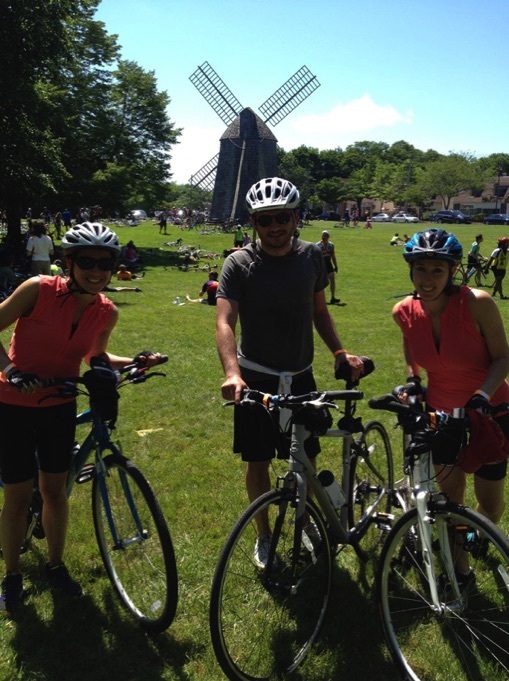 We will stop at the Amagansett rest stop on the way to Montauk to pick up additional passengers, but we can not unload your bike at Amagansett so you can continue riding. This service goes from the Amagansett rest stop to the Montauk finish line. S.A.G.ed riders will be taken to Montauk, so you won't miss your friends, the party, your luggage, or your ride home! If you ship a bag to Montauk in our luggage truck but never make it to the finish line, we'll bring your bag back to our office for you. We are located a convenient 10,000 miles from where you live. Reach us after the ride at luggage@ridetomontauk.com. We will not be able to check our email until the Monday after the ride. We will not be coherent enough to answer it for another day or three after that. Photo by Pamela Rathsman. 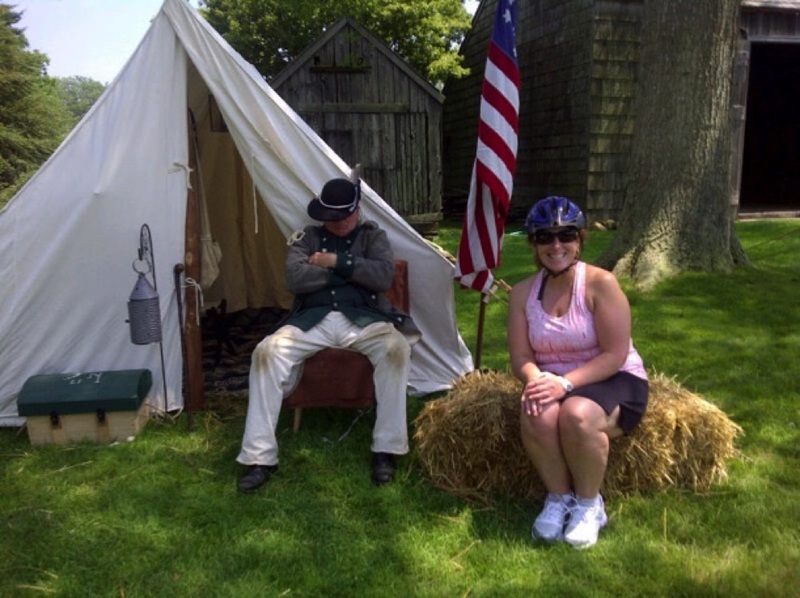 According to Pamela, this was a civil war reenactment she came across during the ride. The guy dressed as a soldier really was asleep, and never woke up while she took this great photo. Our S.A.G. team members are really smart -- they have years of experience. They know what time the transportation home is leaving. They know how fast cyclists can pedal. If they offer you a lift to the finish line, it's not to pester you -- it's because they know that if they don't help you, you are going to miss the last transportation home, and you'll be stuck in Montauk overnight. Please don't argue with them -- they're trying to help you. The S.A.G. team's goal is to get everyone to Montauk no later than 6:00 p.m. by hook or by crook. That will give you enough time to eat, shower, change, and get on the last transport home. We ride on public roads, and we certainly can't make you accept a lift, but if you refuse end-of-the-day S.A.G. service, you are on your own, and we can not guarantee you transportation home, showers, first aid, luggage service, food, or a place to sleep. In fact, if you’re out in the Hamptons section of the ride you’ll probably be attacked by a gang of marauding Lexus owners. On the day of the ride we'll give you a route sheet that includes a schedule of how far along you should be at specific times to avoid getting S.A.G.ed.